Affiliate marketing is not new in the field, but recently, it has been winning increasing popularity and solid revenues. Have you heard that one influencer managed to generate $7 million in retailer sales for one year? Decent earnings are an attainable goal for the affiliate marketer. Still, like anything else, it has its pros and cons both for businesses and affiliates themselves. Browse through this post and find out whether you want to give it a try. It’s a method of online marketing where some business puts its ads, banners or links on the third-party’s websites, blogs, Youtube channels, etc. In practice, it looks like this: you have a popular Youtube channel or Instagram page about, say, breeding Jack Russells. You think: hey, I’m using this kind of dog food for my puppies, why not tell people about it? You contact the dog food representative and say that you want to become an affiliate. They provide you with a link, banner or whatever, which you place on your page. Now, when you are talking about this tasty treat for your pets, and people check it out for themselves, you get a bit from product sales. Next day, a grooming business knocks to your mailbox and suggests you place their banner on your page. Why not, you say, my friend visits this salon with his collie and always gives positive feedback. And you have one more passive income. Businesses love such cooperation. They get access to the target audience; they spare their costs paying for actions only; they don’t annoy people with irrelevant ads. And they are ready to invest in affiliate marketing – the spendings for this online strategy are predicted to reach seven billion by 2020. Why not get a bite? You are an independent marketer and can choose the product or brand you want to advertise. You may devote your time to making up the marketing strategy, acquaint your users or followers with a product, write reviews or film trials. Or you may not. It’s totally up to you; however, the more users come from your page to buy a product, the more you earn and the more valuable you become for a vendor. Here’s the list of most significant pros of becoming an affiliate. Anyone can join the business – for free. It’s perfect if you have your website, landing page or blog – adding affiliate links won’t be a problem for you. But even if you don’t have any of the mentioned resources, you still can enter this field. There are several ways: via social media profiles; participating in conversations and promoting relevant products in thematic forums, discussions, comments, etc. ; publishing valuable and original content – reviews, analytics, professional insights, etc. on the third-party websites with the affiliate link included. No experience required. You don’t need years in marketing to become an affiliate. You can test various approaches and learn on the go. You can find out what works better – paid campaigns, organic searches or straightforward mentioning of the product in your post – and create the winning strategy that earns your most. It’s a hassle-free and flexible business. You can choose the time and place for your work; niche and specific services you want to advertise; promote one or several products; abandon those that are hard to sell and concentrate on things that have more perks; work without any investments or pay for domains, campaigns, etc. No limits for you. Affiliate marketing can actually open all your unrevealed potential. You can find out whether you are good at writing exciting life stories or in-depth field analysis, filming videos, making photo reports, or convincing the readers that you know better. And all this can be done in your free time, as an addition to your main job. Sounds appealing, doesn’t it? Still, like everything in this world, affiliate marketing has its pitfalls and difficulties. You should know them to make a grounded decision. You have to act with regard to the vendor. A merchant decides on the type of ad you have to post, and you usually cannot adjust the campaign to your audience’s needs. 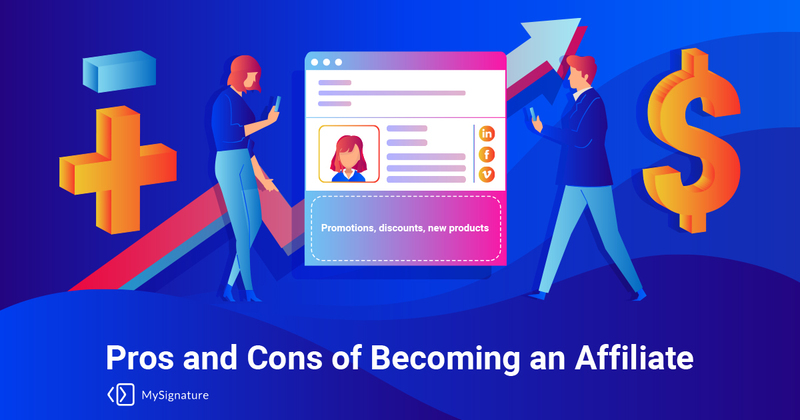 If it’s a small business, you can discuss the terms and conditions of the affiliate marketing campaigns, but well-known brands won’t pay attention to what you think is better at the moment. Unless you generate really significant revenue. No customers are coming back. If the users buy your vendor’s product on your tip, they won’t do it again from your website – they will shop directly on the business’s one. This is a one-time win, unfortunately. There are, however, some merchants that pay the commission to the affiliate marketer during the whole time the engaged customer stays with the brand, but it’s not a common practice. Even well-known brands can renege on their promises. Affiliating is a pay-per-performance business. And sometimes, a vendor just doesn’t pay for the customers you’ve attracted or pays lesser. So, before starting, check the reputation of the brand, find out the conditions of the affiliate program and ways to check the number of customers from your website and the sum they brought to the business. Freelance jobs are not for everybody. You have to be the right kind of person to benefit from this work model. Time management and adept organizational skills are a must. Besides, would you be comfortable working at home, with no one for a coffee and chat? And while this problem can be solved by coworking spaces or cozy cafes with good Internet, the unstable income can draw anyone crazy. You can only guess how much you will get this month, and even if it’s your side job, the uncertainty of your earnings can be quite overwhelming. So, that’s all the important things you have to take into account. If you want to test the waters but not sure where to start, consider MySignature affiliate program. We are a startup, and affiliate marketing is a perfect strategy for us. Right now, we are building our brand identity and looking for the partners. Fair rates and transparent cooperation are the backbones of our strategy. Interested? Get in touch with us to receive an affiliate link. Next PostNext How to make your recruiting emails read by candidates?